The annual growth has been rather stagnant from 2013, and it increased exponentially in 2017. 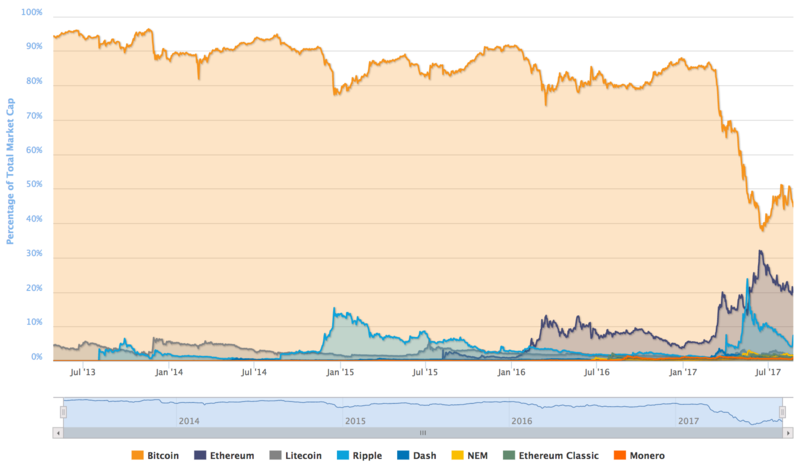 The growth in 2017, happened from March to mid-June – thanks to Ethereum (the incorporation and announcements of the Ethereum Enterprise Alliance) and Ripple - before it “corrected” down, then moved up again to a new all time high (ATH) in August, post-Bitcoin Cash hard fork. At the time of writing (23 Aug 2017), the crypto market cap is at staggering US $151.861. The majority of this, currently sits in Bitcoin. When a significant amount of the global GDP (Gross Domestic Product) is stored in cryptocurrency – as predicted by Deloitte by 2025 – the question you want to ask yourself is, do you want to miss the boat?